It´s an easy exercise for students to practice the use of A, AN, SOME or ANY. 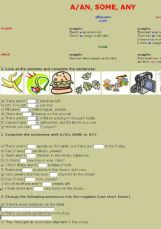 There are four different activities and a short grammar explanation at the beginning. I hope you find it useful!